Long-time member Betty Sheard lost her footing and injured herself on Tuesday 11th March after bingo when she left the club. Although Betty does not hold the club responsible or feel that the steps are dangerous, members are urged to take care when leaving the club. 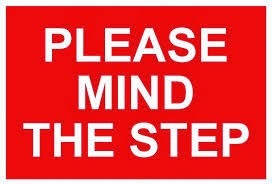 A sign will be fixed to the back of the main door soon reminding members to watch their step on their way home. Betty is now thankfully on the mend and it did not prevent her from playing bingo the following week!